Since the new flags for closing (which I applaud) it is unclear to me how I can flag a question about Windows, Mac, Solaris or whatever which clearly does not belong here. If not, should this be changed? 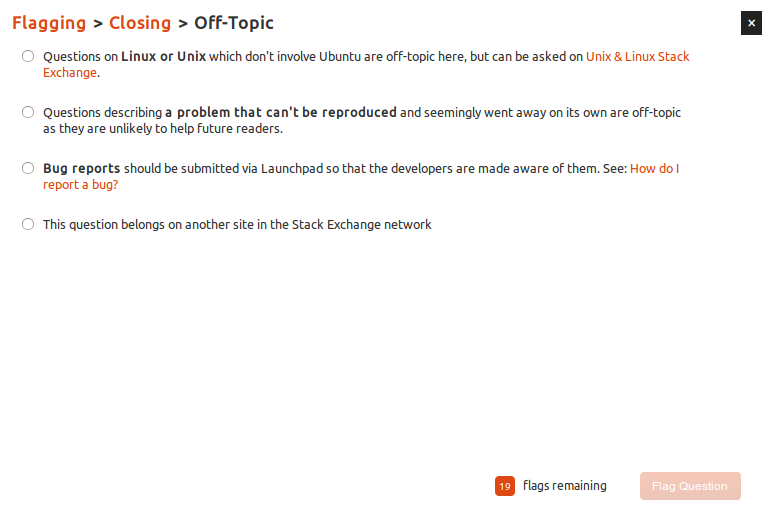 I'd say that out of these, "Another site in the Stack Exchange network" works nicely for this. OSX + Solaris would (in part, at least) be covered by the scope of the Unix SE; most other operating system issues (Windows, and non-Unix-related things within OSX for instance) would go over to Super User. I've not used any of the other SE sites so I could be wrong, but that's pretty much how the situation looks for me. Questions asked here but not under the scope of this precise site are probably going to be covered by one of the other sites, they just need to be given a nudge in the right direction. Not the answer you're looking for? Browse other questions tagged discussion support close-reasons flagging scope .